Well my site has been on line since 2008 and still attracts plenty of visitors, I also get feedback and messages via the Contact page, which is always interesting and very welcome. Nice to hear from friends and acquaintances from the past and find out what they are doing now. This has prompted me to add a ‘Postscript’ page featuring a few of the things I have been doing since scooter racing and also now having sold the GP200 I restored from the imported Indian GP150 featured on this site. Over the past fifteen years my wife and I have taken to walking, mainly in the UK, we are lucky to live close to the South Downs which provides many great walks, but we also like to walk in the Cotswolds, Yorkshire Dales and Cumbria and usually have a week in each of the latter two every year. 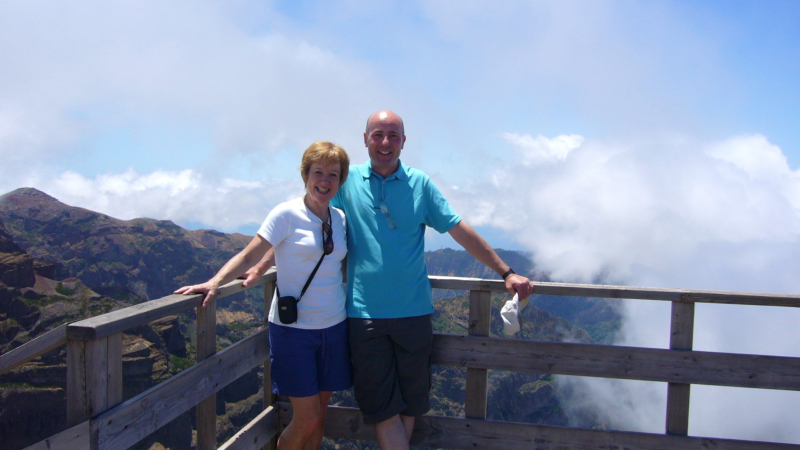 We have also walked abroad on a few occasions. 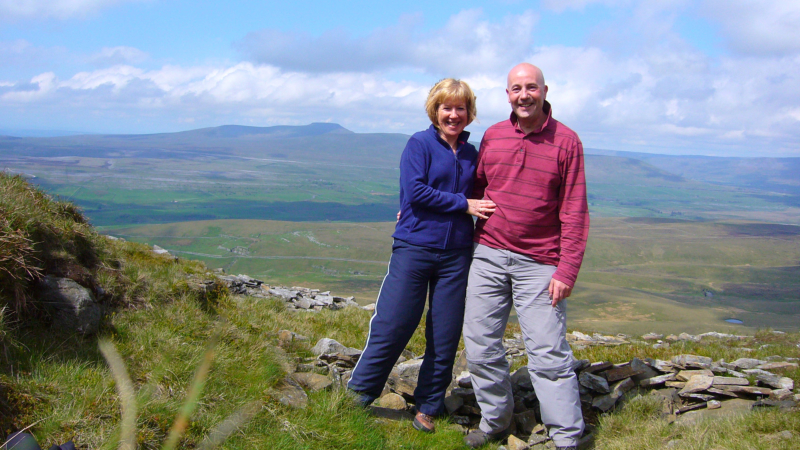 Here are a couple of images, the first being from a holiday in Madeira and the second is in Yorkshire, here we are on our way back down to Horton having walked up Pen-y-ghent. Like many people I have long had a desire to play a musical instrument and so decided to have guitar lessons. It soon became apparent I was not going to be a ‘natural’, however I persevered and can stumble my way through a couple of songs. here I am with my daughter Jessica, having a go at Rod Stewart’s version of Amazing Grace on which I believe Ronnie Wood played the acoustic guitar. Click the image at your own risk to see the video. Something now with a racing theme, back in 1991 I built what I called a computer controlled Scalextric, which essentially means one of the cars is controlled by a computer so you can race against it. These are now called Pace car systems and commercially available, however back in 1991, as far as I am aware no such systems were available.Click on the image to see a brief overview and demonstration of the system in action. Well, I seem to have come full circle, now back to the hobby I started at about the age of 10, building and flying model aircraft. Here are a couple I have built during 2016-17; the blue and yellow model is a sports aerobatic model powered by a 6.5cc 4 stroke engine - click play to see it in flight. 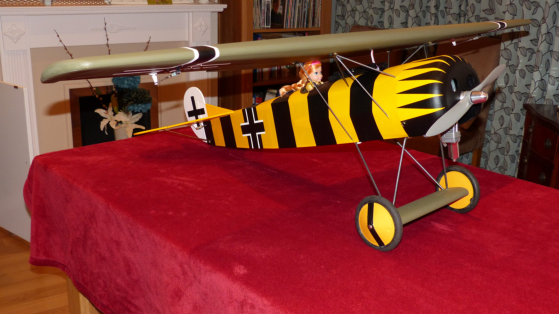 This yellow and black aircraft is a semi scale model of a German Fokker DVIII from the first world war, powered by an 8.5cc 4 stroke engine.